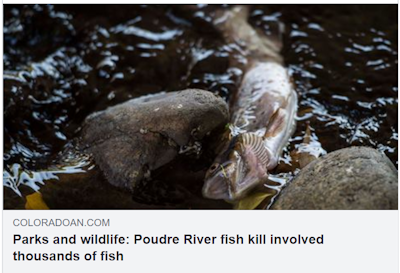 Fort Collins: Recent news reports have indicated that the fish kill on the Poudre River through Fort Collins has wiped out thousands of fish (see Sept 28 Coloradoan story here). Further, one of the prevailing hypotheses for the kills is warmer temperatures and lower flows in the Poudre River. Further yet, warmer temperatures and lower flows may be the exact future for the Poudre River as climate change intensifies and if the Northern Integrated Supply Project (NISP) is built. About 63% of the water in the Poudre River is already drained out by cities and farmers before the river reaches downtown Fort Collins. If the Northern Integrated Supply Project is built, about 40% of what’s left of the peak flow of water during May and June will also be drained out (see July 20 press release here). Even worse, the proposed ‘mitigation’ for the huge negative impacts on the health of the river wouldn’t extend downstream past LeMay Avenue in Fort Collins where the fish kill has occurred. October 4th is the deadline for comments to the Army Corps of Engineers on the Final Environmental Impact Statement for NISP. The public can send in comments to the Army Coprs by clicking through to Save The Poudre’s ACTION PAGE HERE.